The 10-day celebration of Jewish New Year starts with Rosh Hashanah and ends with Yom Kippur. This time period is often referred to as the High Holidays or High Holy Days, which usually fall in September or October. 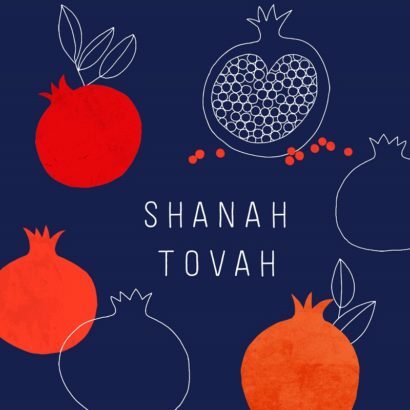 Hallmark offers Rosh Hashanah cards from its Tree of Life brand, one of the most extensive card offerings for Jewish consumers. The tradition of sending greeting cards for the Jewish New Year originated with Jews in Germany in the mid-1800s. Hallmark started making cards to commemorate Jewish New Year in the 1940s. Jewish New Year is the most important and widely celebrated of all Jewish holidays. The origin of Jewish New Year can be traced to the Bible, and Jewish people have been celebrating it for thousands of years. Rosh Hashanah, which is celebrated the first and second days of Tishri (the seventh month of the Jewish calendar), marks the time when, according to tradition, God created the world. For Jews worldwide, this is a time of introspection, looking back at the past year and planning for the new year ahead. It is the only Jewish holiday that is purely religious and not tied to historical or natural events. Rosh Hashanah, which means “new year” in Hebrew, is a time of family gatherings and religious celebrations. Families gather for a traditional holiday meal, including apples dipped in honey, which symbolize the wish for a sweet new year, and challah bread baked in a round or dome shape to symbolize a wish for a well-rounded year without sorrow. The sounding of the shofar, an instrument made from a ram’s horn, is an important part of the celebration. The shofar is blown 100 times every day of Rosh Hashanah and at the end of Yom Kippur. Yom Kippur, observed on the 10th day of Tishri, is also called the Day of Atonement. It is the most solemn day of the Jewish year, observed with fasting, reflection and prayer. One of the ongoing themes of the High Holy Days is the concept that God has “books” with everyone’s names inscribed – a listing of who will live, who will die, who will have a good life and who won’t – for the coming year. The books are written on Rosh Hashanah, but an individual’s actions during the 10-day period can alter God’s decree. The books, and therefore the fates for the year, are sealed on Yom Kippur.